You’re Doing THAT in the Talent Show?! 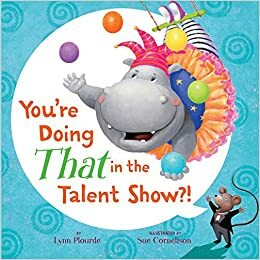 By Lynn Plourde, illustrated by Sue Cornelison. Summary: Penelope and Tiny are best friends, but when it comes to the talent show, they can’t agree. Penelope wants to be front and center, whether it’s dancing, acting, singing, or a combination of all three. Tiny can’t imagine being in the spotlight, and advocates for a performance with the chorus. Finally, they come up with the perfect solution: to perform separately, but cheer each other on enthusiastically. The plan goes off without a hitch, and Tiny even gets a chance to save Penelope’s act from a potential disaster. The last page lists tips for a spectacular performance. 32 pages; ages 4-8. Pros: The classic story of an introvert and extrovert trying to work together. Bright, cheerful illustrations and a friendship with a perfect ending will keep readers happy. Cons: The text got a little repetitious.